Of late, we read many fake job opportunities which offers more than the market rate. Forget the Mrs James and Such a name, this is more elaborate and made by so many people, a syndicate I believe. One of them is that someone will offer you 25% of the sales from any EBAY Auction generated through your userid. Some even offer $150 and they claim that they will ship first, pay later. Don’t be fooled. I was fooled once and ebay took away my privileges. Took me 3 weeks before I get my account back online. I asked the person for proof of ID and Address and he can only give me a sanitized US Passport. If you compare the details properly, the second line of the MICR does not add up. It’s simple to know if the person is dodgy. Even if you are in another country, then a stamp on the passport will do fine. Someone who is born in 1985 sure look as if he is 40 years old and US don’t issue 10 year passports anymore! 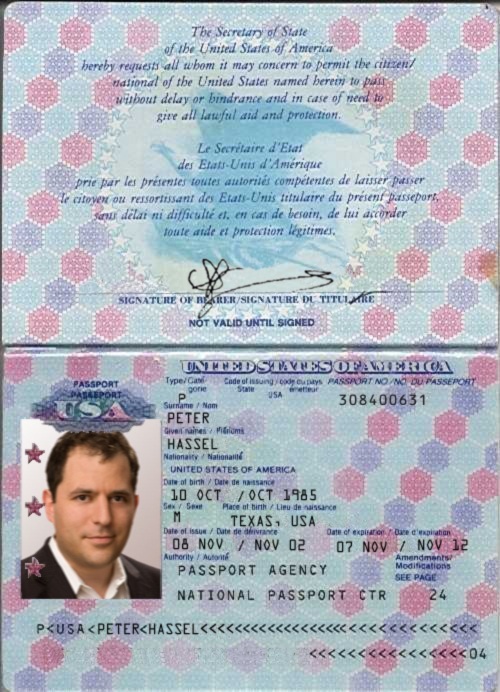 The first line should read <P<USAHANSELL<<PETER<<<<<<<<<<<<<<<< not USA<PETER<HANSELL ..there is no way in hell someone is using PETER as his SURNAME and be addressed as Mr Peter. Other examples of real passports are from SINGAPORE such as PASGPTAN<<AH<KAO (Mr Tan Ah Kao) or P<SGP<MUHAMMAD<<BIN<ABDULLAH (Mr Muhammad Bin Abdullah) or PASGPSINGH<<GURMIT< (Mr Gurmit Singh aka Puah Chu Kang). In Malaysia they will be P<MYS<MAHATHIR<BIN<MUHAMMAD< as they don’t use surnames for Muslims. There have been much scam going about, from Victoria, Australia to New Jersey USA and even as remote as Hainan in China. All these can be derived from the email address and headers. Emails from Yahoo have headers, and so with Hotmail. This is a clear cut that this email was sent from ITALY using a machine mimicking EXPO2012.OR.KR and infiltrated email account of MADIKIZA . You can always ask if these are scams or not to me…as I can smell them a mile away. Some recruiters even fool the University and Ministries to allow them to interview candidates at embassy premises. This is rampant with Middle Eastern countries. I have a confidential list…and if your recruiter is legit, ask the document to be signed and stamped by the Department of Business Commerce or a Court. Legalise the document and verify at the embassy immediately. I got conned ….while on JOBSTREET. Costly for me….so can I sue JOBSTREET?